The sign was ripped off and (inset) fencing damaged. Vandals who damaged a sign and fence at the premises of a local community association in Limavady at the weekend have been condemned. The damage was discovered during the early hours of Saturday at Bovalley Community Association’s community house in Drumachose Park. A PSNI spokesperson said: “At 3am on Saturday 12th, police received a report of vandalism at the community centre at Drumachose Park. Police said a man aged 29 and a woman aged 28 were subsequently arrested on suspicion of criminal damage and “were later bailed pending further enquiries”. A spokesperson for Bovalley Community Association said the local community was angry at what happened. “It’s totally uncalled for, to attack premises like that, and people are disgusted by this,” said the spokesperson. DUP Alderman Alan Robinson said he was “bitterly disappointed to learn of vandalism to the fencing, signage and gardens of the community house over the weekend”. “Having successfully lobbied extensively over a period of several years for a community facility in the Edenmore Road area, it was disheartening to be told on Saturday morning of the overnight damage,” said Colr. Robinson. Colr. Robinson also hit out at vandals who, during the weekend, left a play park in another area of the town in what he described as “a terrible state”. 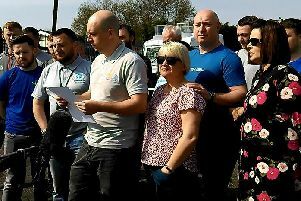 “I was made aware from parents who had taken their children to the children’s play park on Sunday that it was strewn with litter and broken glass,” he said.